This “extremely rare”, uniquely Khmer Avalokiteshvara is a thirteenth-century statue from Cambodia. 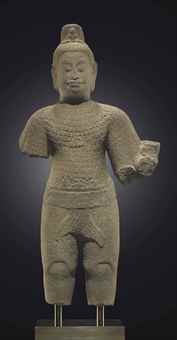 The statue’s face is “striking[ly] similar to portraits of King Jayavarman VII, who constructed Prasat Bayon (the Temple of Bayon) at Angkor, so Christie’s description is “Bayon style”. Has the sandstone sculpture been broken off its base at the lower leg? Its collecting history is only traced back to its sale through Christie’s Amsterdam auction house on the 1st of June 1988, since when it has been in the collection of Dr. and Mrs. William T. Price.